Acoustic sensibilities from two diverse backgrounds converge in a homage to the quintessential sounds of American rock music. 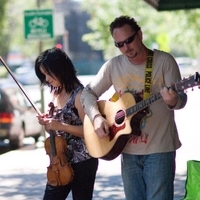 Randy Bales (guitar, vocals) and Dr. Lisa Chu (violin) bring fresh collaborative energy to their interpretations of cult classics as well as their own captivating original music. Their sounds recall a familiar time, with the exciting twist of modern inspiration. In performance, you can now hear original music created by Chinese Melodrama, as well as their signature acoustic interpretations of cult classics by celebrated musicians ranging from Neil Young, Cat Stevens, and James Taylor, to Led Zeppelin, Pearl Jam, Soundgarden, and Metallica. Great to happen upon your music last night. I don’t know about the name though, there is SO much more than the sum of the parts. Good big sound, that is hard to do in any capacity. Great instrumentation, love to see you add Riq or Tar. It would be nice to have bios without the distraction of ambient noise, a bit more in production values, (mic and quiet) would serve the curious with the same quality you put into your music. I know you did not ask for this but I could not help myself. I like your music, i would like to see you succeed. Duly impressed nonetheless, and with pretty much all of the musicians that came up. What a treat. Lemme know if you want photos and video. Your band would be fun.